When people ask, “How can I go green, where do I begin?,” I always have the same answer, “you’ve already begun!” A thoughtful understanding that an outside space can have a positive impact the environment is the best first step to a green garden. Another important step to take is to reduce your lawn area by at least half. Substitute lawn areas with ground covers that will provide beautiful colors and textures to your spaces. Groundcovers also help retain moisture in the soil and help prevent erosion. Creeping thymes and Creeping Jenny (my favorite) are good choices for sunny spots, and for shadier areas, tiny creeping mints such as Mentha requienii will do well. Black Eyed Susan grown en masse make for an eye-catching and bright display. Some nice low-water choices include Trailing Yellow Dalea and Trailing lantana. 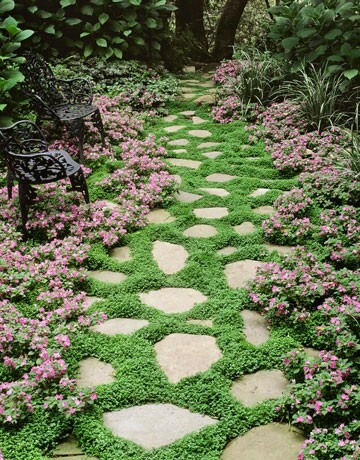 Adding stone elements and pourous pavers can help create wonderful garden paths. Another substitute? Vegetables. A small area dedicated growing your favorite vegetables will transform the most unproductive area of your landscape.